Podkayne lives on Mars. She’s going on vacation. Her little brother gets in trouble. That’s about it. Podkayne lives on Mars with her family. When the family’s vacation to earth is derailed by a mistake at the baby-kryo lab, Podkayne suddenly has no trip to earth and three baby siblings to help look after. That’s when Uncle Tom intervenes and offers to take Pod and her brother Clark to earth himself. Pod sees this trip as an adventure, but she soon realizes that Uncle Tom is keeping secrets and her brother is up to something. This book isn’t bad, it’s just not great. There are much better Scifi stories out there. This is more of a sci-fi themed coming of age story. Pod learns the world is not a comfortable, safe place for an adventure. People get hurt on adventures. I don’t usually look into what the author says about their own work but given that this book had a rewritten ending, I decided to look into it. Heinlein said that he wanted Podkayne to learn the importance of adults protecting children. According to Heinlein the real problem in the story is Pod’s neglectful mother putting her career ahead of her family. The added epilogue even says as much. This is unfounded. When the whole kryo-baby drama happens, and the family suddenly has triplets. Pod’s mother cancels her consulting projects and launches into mommy mode. Pod says she even fusses when she is away from the babies for a few minutes. This is clearly a woman who loves her children and sacrifices her career for them. There is no indication that she is neglectful or putting her career first. I am no fan of daycare, because it is better for a child to have one on one care, but in the book there is even this creepy thing at the kryo-baby place about some parents wanting their babies raised by robots for the first few months so that they don’t have to deal with the midnight feeding stage. How f—-ing creepy that is never addressed, nor does this book explore the complexities of motherhood. Heilein’s criticism seems to be at the very idea of a mother having a career. According to Heinlein, Pod’s mother is responsible for the mess that Clark gets into because she cares too much about her career to keep her son in line. While the kids are on Mars, Clark is just a clever prankster. The quint essential annoying little brother character. Since Pod is our narrator I just assumed her insistence on how horrible her brother is was her being a dramatic teenage girl talking about her twelve year old brother. Clark does get wrapped up in serious trouble, but it’s not under the eye of his mother, it’s under the eye of Uncle Tom. He is the one who let’s Clark run wild, not his mother. I have mixed feelings about the way that Pod herself is characterized. She fawns over babies a little too much for a teenage girl who dreams of exploration. It ties into Heinlein’s theme of Pod learning to take care of the young, but it’s weird to me. I must admit that Pod’s dream of being a spaceship captain is well handled. It’s clear that Pod’s dream is to exploring the galaxy, not in commanding a crew. So Pod’s calculation that she could be just as happy exploring the galaxy as a member of a spaceship crew, without the stress and responsibility of being captain is a good one, and I must admit, a very feminine kind of calculation. I do prefer the original ending (Clark’s last addition to his sister’s diary) It’s much better than the official ending (the letter home) that the publisher made him stick on the end, but even the original ending does not make me like this book. 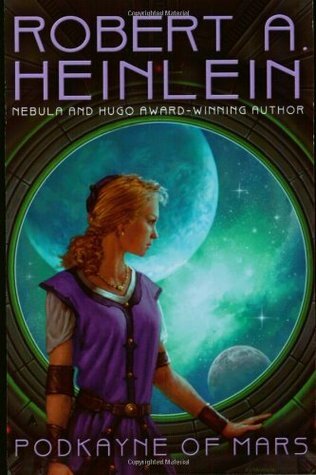 Podkayne is my least liked Heinlein book. I first read the book back in HS and always felt that Podkayne brought everything on herself. I read it a second (and final) time when the reedited version came out and found that I prefer RAH’s original ending. It is the more logical conclusion.